This week we’ve been studying sentence style. Examples that we read of authors with awesome sentence style include Virginia Woolf, George Orwell, and E.B. White. Sentence style elevates the author’s writing so it flows smoothly, omits needless words, has parallel construction, and uses active voice. Please note that in the illustration above, the third voice example has a run-on sentence: “Don’t worry it’s fine” consists of two complete sentences (or two independent clauses). I fixed it with a semi-colon which usually does the trick. Also note that “voice” can refer to how a writer sounds on the page–whether readers can hear the writer’s voice in the text. 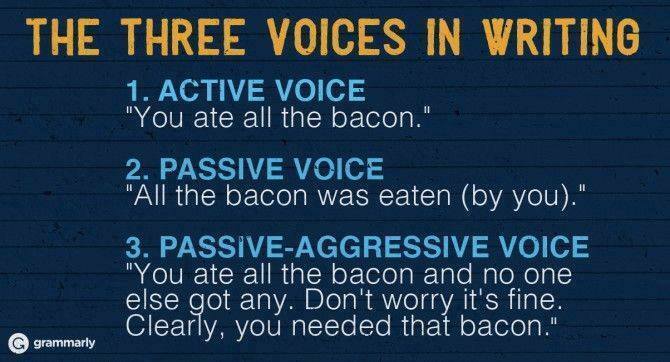 That voice is often reflected in sentence style. Revising for this kind of voice isn’t so easy, so that’s a post for another day.